Yesterday we shared a post about our complete upholstered bed bases designed to co ordinate with our custom made padded bedheads. 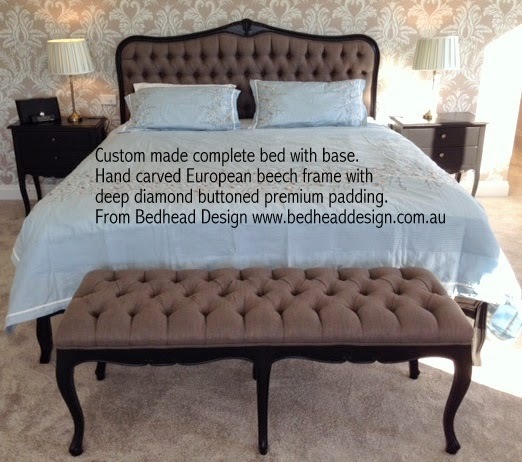 We can make our custom made complete bed bases to match all our bedheads ever our more unique designs such as our Portia deep diamond buttoned bedhead with European beech hand carved frame. This is one of our most beautiful and expensive designs due to the ornate hand carved frame detail. The Portia a classic upholstered headboard that will never date. Also available with a rattan insert rather than upholstered with fabric. Some people love the rattan for a 'beachy' look or just something different. We can also custom paint the European beech wood frame with a custom painted finish that is hand painted by a professional artist. We can match your bedhead to any colour and create a unique finish that is individual specially made for you. The Portia deep diamond buttoned bedhead with complete bed base and matching end of bed stool. Made to order and upholstered in any fabric. European beech wood frame with hand painted finish available polished or painted. 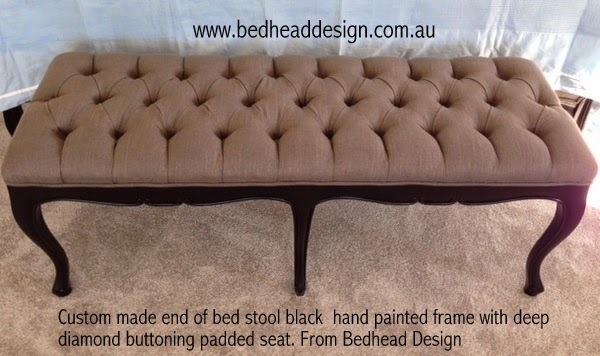 Custom made end of bed stool with deep diamond buttoned premium padded top and a black painted finish. We also make a custom made sleigh bed as pictured below, complete with upholstered bedhead, sides and bed end. It is a classic and elegant bed that has been beautifully hand crafted. Featuring a hand carved European beech wood frame available polished or painted. The Lina sleigh bed pictured below in our Waterloo showroom is a show stopping piece of furniture that will last a lift time. Upholstered in a Westbury Belgium linen and polished frame the Lina wooden bedhead gathers alot of attention. Its hard to see the quality of workmanship and high attention to detail from the images. Lina complete upholstered bedhead with complete bed featuring upholstered sides and bed end. The Lina sleigh bed is a beautiful classic addition to any bedroom. Seen here with the matching European beech bedside tables also available from Bedhead Design. The Lina sleigh bed as seen in our Waterloo showroom upholstered in Flax colour Belgium Linen. The upholstered headboard on the Lina sleigh bed features hand carved floral detail on the European beech frame. The bedhead can be deep diamond buttoned or just flat padding as seen in the image above. We use premium foam and the Lina sleigh bed is top quality. The Lina sleigh bed end has a beautiful hand carved frame and thick premium foam padding, it is slightly lower than the upholstered bedhead but looks the same with hand carved floral detail. Visit our Waterloo showroom to see our Lina sleigh bed as well as many other Bedhead Designs, bedsides, end of bed stools and much much more!